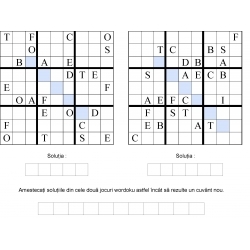 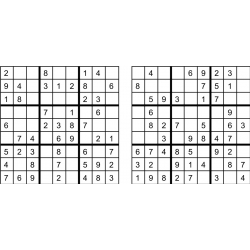 Twin Corresponding Sudoku consists of a pair of standard sudoku puzzles each with some starting digits. 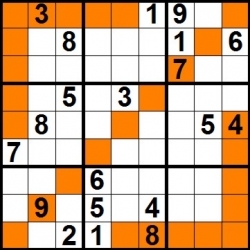 To get a complete solution for the twin puzzles, it is necessary to solve each twin puzzle, but the complete solution of the twin puzzles will be obtained by substituting the corresponding values of the digits from one twin sudoku into the other. 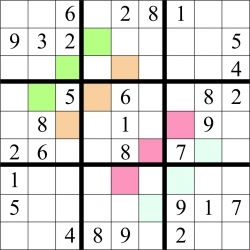 For example, in row 2 column 1, in twin 1 (sudoku no.1) contains the number 9 and twin 2 (sudoku no.2) contains the number 8. 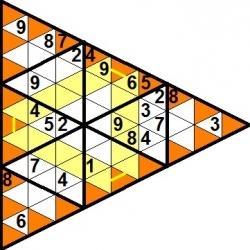 This means that wherever 9 appears in twin 1 , it should be substituted by 8 in the corresponding position in twin 2 and wherever there is a 8 in twin 2 there is a 9 in twin 1. 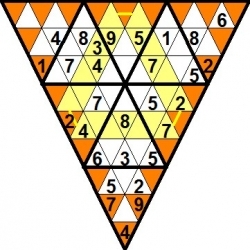 This immediately gives you some more starting digits in each twin. 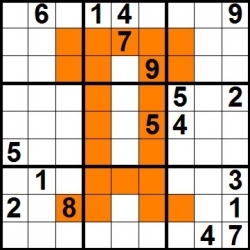 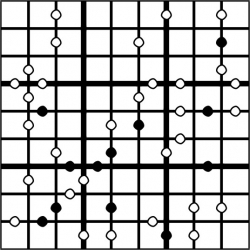 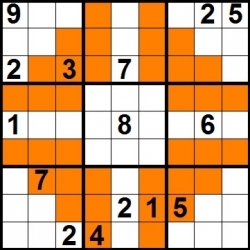 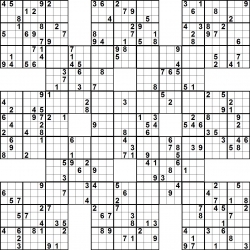 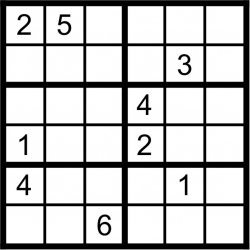 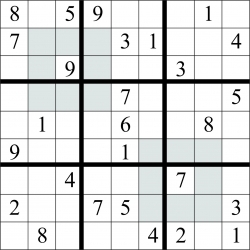 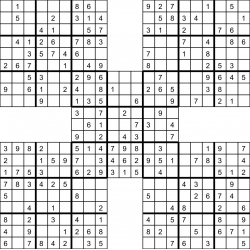 Samurai Sudoku puzzles consist of five overlapping sudoku grids. 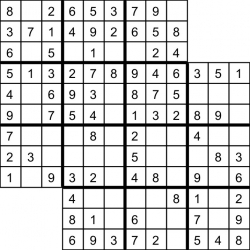 Fill in the grids so that every row , every column , and every 3x3 box contains the digits 1 through 9. 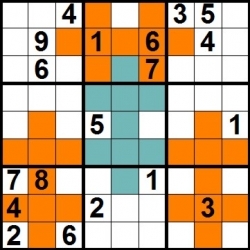 Fill in the two grids so that every row , every column , and every 3x3 box contains the digits 1 through 9. 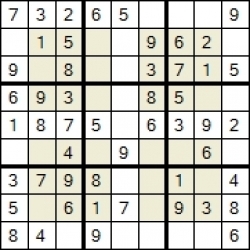 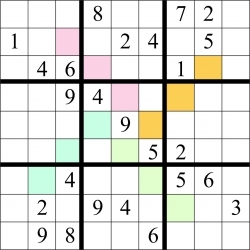 Fill in the grid so that every row , every column , and every 3x3 box contains the digits 1 through 9..Sudoku may contain additional four regions 3 x 3. 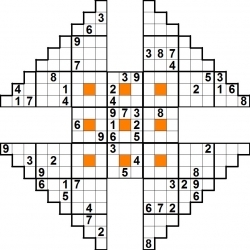 Fill in the grid so that every row , every column , and every 3x3 box contains the digits 1 through 9. 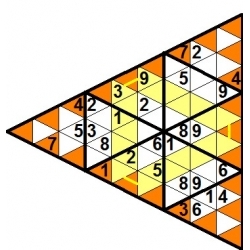 In the marked diagonals all digits must be different. 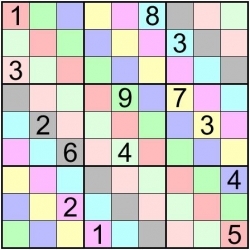 All diagonals of 9 cells (marked with the same color) contain the digits 1 through 9.